Acer and Windows 8 may be all over the upcoming Star Trek Into Darkness movie, but Linux is actually the go-to platform on the International Space Station these days. Although Windows 8 offers built-in anti-virus software called Windows Defender, the ISS really needs an operating system that is less targeted for cyber-attacks than Windows, according to ExtremeTech. The ISS has already experienced the headache of having infected computers onboard after a Russian cosmonaut accidentally brought a laptop infected with the W32.Gammima.AG worm to the station, which ended up contaminating all the other laptops on the station. As a space craft that has continuously been in orbit for the past 12 years, it’s not like the United Space Alliance staff can just drop by the ISS and swap out infected computers. In addition to security and reliability, the ISS also requires a more flexible platform that it can adapt on the fly, and one that doesn’t depend on Microsoft schedule for updates (like with Windows Blue). Chuvala said both organizations were interested in an open source operating system like Linux because it would give them in-house control. “So if we needed to patch, adjust or adapt, we could,” Chuvala said. According to the Linux Foundation, which has been tapped to train Chuvala’s team on developing software in Linux, the last dozens of Windows laptops that need converting to Linux are part of the station’s “OpsLAN” network, which is essential to the astronaut’s day-to-day running of the space craft. These laptops track the astronauts’ physical locations, inventory, and control all the on-board cameras for photos and videos. 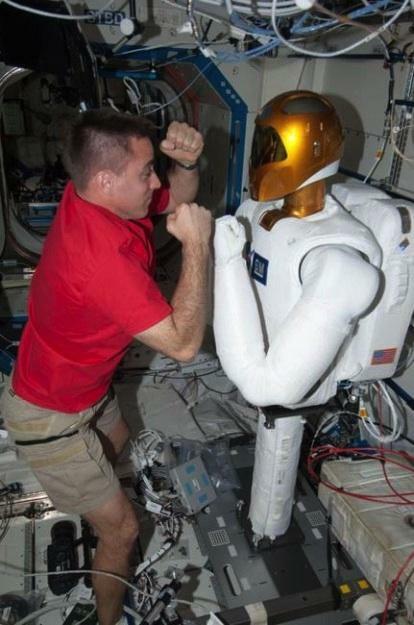 Most systems on the space station already use some form of Linux, including the Robonaut 2 (also known as R2, pictured on the right), which is expected to take over some of the “tasks too dangerous or mundane for astronauts in microgravity.” The R2 is already a Linux-bot, so both the on-board astronauts and the ground crew are trying to learn to use the platform to better communicate with the first humanoid robot in space.